Grand Reopening of the Soldiers Memorial Museum and Plaza. The reopening of the newly renovated Soldiers Memorial Museum and Plaza will take place during the week of Saturday, November 3rd through Monday November 12th. The week-long Veterans Day celebration will feature ceremonies honoring veterans, daily flag raising and lowering ceremonies, "All is Calm: The Christmas Truce of 1914" presented by the Mustard Seed Theatre, a Wreath Laying ceremony, the 35th Annual Veterans Day Parade on Saturday, November 10th at 12pm, and much more. Some events require tickets. Some events are at different locations. Visiting the Memorial and viewing the exhibits is always FREE. Hours are 9am-5pm, daily; closed Thanksgiving Day and Christmas Day. See website for more information. Soldiers Memorial Museum and Plaza is the location of many events throughout the year. 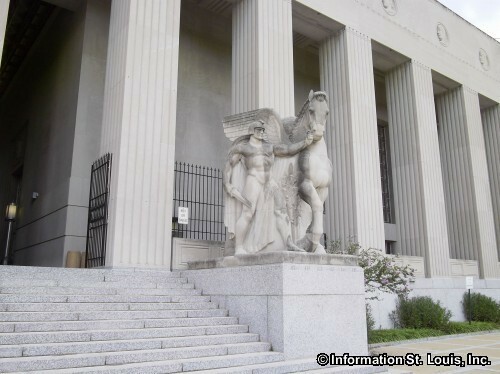 The Missouri History Museum took over the maintaining of the Soldiers Memorial and after an extensive renovation of the Museum and Plaza, the Memorial reopened in November 2018. Directions: Located in Downtown St. Louis, bordered by Market Street to the south, Chestnut to the north, Tucker to the east and 14th to the west. Across Market Street from the St. Louis City Hall.